Sixty million years ago, a thick layer of limestone was slowly formed at the bottom of a shallow sea. Today, that same rock formation lies beneath the vast deserts of Saudi Arabia. Alongside the Dahna sand dunes, not far from Riyadh, the Umm-Er-Radhuma limestone is riddled with countless holes known locally as Dahls. In the western half of Saudi Arabia, lie 85,000 square kilometers of barren lava fields. Here cave explorers have found long, smooth tunnels, some of them up to three million years old. These are called lava tubes and they contain the bones of people and animals that lived in Arabia long ago. 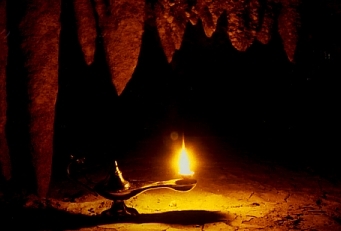 Since the 1980's a number of beautiful and sometimes curious caves have been found in both areas of the country and reports on them have appeared in various publications. The SaudiCaves website hopes to bring such cave reports, maps pictures and other information together in one location for the benefit of researchers, explorers in Saudi Arabia and, of course, the general public. If you're looking for something related to the caves of Saudi Arabia, you'll find it here! The goal of the project is to assist in the protection and preservation of Saudi Arabia's caves by informing visitors to the caves, as well as the general public, about the extraordinary fragility of that marvelous world underneath the desert and the various dangers threatening it.